Besides indication in percentages the acid concentration of chemicals is also expressed in degrees Baumé (°Bé). 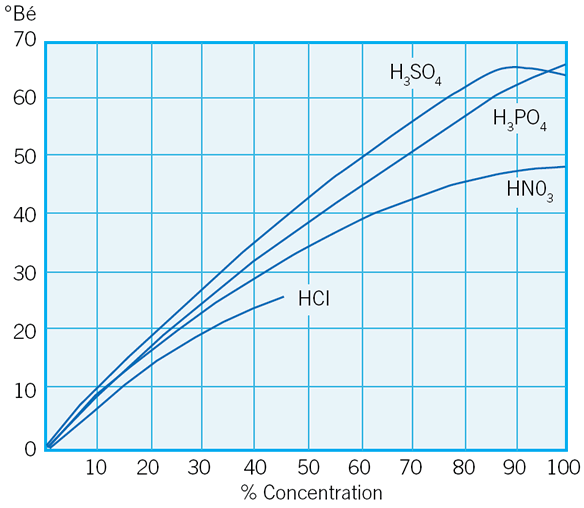 For the four most common acids the graph below can be used to see how many degrees Baumé correspond to a certain concentration in percentages (and vice versa!). The degree of acidity is also given in practice with the hydrogen exponent -pH- (negative logarithm of the concentration of hydrogen ions). The pH value of clean water is 7. Solutions with a pH of 0-7 are acid. The higher the figure the greater the concentration. Solutions with a pH of 7-14 are alkaline. The higher the figure, the greater the concentration.